In addition to activity at the KOR, 5'-GNTI has been found to act as a positive allosteric modulator of the α1A-adrenergic receptor (EC50 = 41 nM), and this may contribute to its "severe transient effects". ↑ Jones, RM; Portoghese, PS (2000). 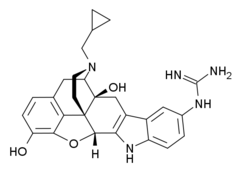 "5'-Guanidinonaltrindole, a highly selective and potent kappa-opioid receptor antagonist". European Journal of Pharmacology. 396 (1): 49–52. doi:10.1016/S0014-2999(00)00208-9. PMID 10822054. ↑ Negus, SS; Mello, NK; Linsenmayer, DC; Jones, RM; Portoghese, PS (2002). "Kappa opioid antagonist effects of the novel kappa antagonist 5'-guanidinonaltrindole (GNTI) in an assay of schedule-controlled behavior in rhesus monkeys". Psychopharmacology. 163 (3–4): 412–9. doi:10.1007/s00213-002-1038-x. PMID 12373442. ↑ Bruchas, MR; Yang, T; Schreiber, S; Defino, M; Kwan, SC; Li, S; Chavkin, C (2007). "Long-acting κ Opioid Antagonists Disrupt Receptor Signaling and Produce Noncompetitive Effects by Activating c-Jun N-terminal Kinase". The Journal of Biological Chemistry. 282 (41): 29803–11. doi:10.1074/jbc.M705540200. PMC 2096775 . PMID 17702750. ↑ Mague, SD; Pliakas, AM; Todtenkopf, MS; Tomasiewicz, HC; Zhang, Y; Stevens Jr, WC; Jones, RM; Portoghese, PS; Carlezon Jr, WA (2003). "Antidepressant-like effects of kappa-opioid receptor antagonists in the forced swim test in rats". The Journal of Pharmacology and Experimental Therapeutics. 305 (1): 323–30. doi:10.1124/jpet.102.046433. PMID 12649385. ↑ Obara, I; Mika, J; Schafer, MK; Przewlocka, B (2003). "Antagonists of the κ-opioid receptor enhance allodynia in rats and mice after sciatic nerve ligation". British Journal of Pharmacology. 140 (3): 538–46. doi:10.1038/sj.bjp.0705427. PMC 1574046 . PMID 12970097. ↑ Porter, James; Munro, Thomas A.; Huang, Xi-Ping; Inglese, Carmela; Perrone, Maria Grazia; Van't Veer, Ashlee; Carroll, F. Ivy; Béguin, Cécile; Carlezon, William A.; Colabufo, Nicola A.; Cohen, Bruce M.; Roth, Bryan L. (2013). "Selective κ Opioid Antagonists nor-BNI, GNTI and JDTic Have Low Affinities for Non-Opioid Receptors and Transporters". PLoS ONE. 8 (8): e70701. doi:10.1371/journal.pone.0070701. ISSN 1932-6203.